Hypertension is an overwhelming global challenge. Increasing awareness and diagnosis of hypertension, and improving control of blood pressure with appropriate treatment are considered critical public health initiatives to reduce cardiovascular morbidity and mortality. To assess non-adherence-related factors to antihypertensive medications among hypertensive patients on follow up at Nedjo General Hospital. A cross-sectional study was conducted among hypertensive patients on follow up at Nedjo General Hospital from March 15 to May 5, 2015. A total of 172 hypertensive patients who were available during study period were included in the study. To identify the independent non-adherence-related factors, backward logistic regression analysis was used. Only 54 (31.4%) of the study participants were adherent to their treatment. On multivariable logistic analysis non-adherence was more likely to occur among those with age of >55 years (Adjusted odds ratio (AOR) = 0.10, 95% CI = 0.01-0.85, p=0.035), illiteracy (AOR = 6.76, 95% CI = 1.01-45.08, p=0.049), income status of <500 Ethiopian birr (AOR = 18.51, 95% CI = 1.95-176.06, p=0.011), duration of treatments of >5 years (AOR = 5.41, 95% CI = 1.08-27.22, p=0.041), physical inactivity (AOR = 34.51, 95% CI = 4.66-255.89, p=0.001) and knowledge deficit about hypertension and its treatment (AOR = 7.67, 95% CI = 2.48-23.73, p<0.001). A finding of this study revealed that an adherence status of study participants was low. Thus, greater effort is needed to improve patient adherence to antihypertensive medications. Keywords: Hypertension, Non-adherence, Hypertensive patients Antihypertensive, West Ethiopia, Blood pressure. © 2018 Berisa and Dedefo. Hypertension (HTN) is an overwhelming global challenge [1Perkovic V, Huxley R, Wu Y, Prabhakaran D, MacMahon S. The burden of blood pressure-related disease: a neglected priority for global health. Hypertension 2007; 50(6): 991-7. [http://dx.doi.org/10.1161/HYPERTENSIONAHA.107.095497] [PMID: 17954719] , 2Lawes CM, Vander Hoorn S, Rodgers A. Global burden of blood-pressure-related disease, 2001. Lancet 2008; 371(9623): 1513-8. [http://dx.doi.org/10.1016/S0140-6736(08)60655-8] [PMID: 18456100] ]. Hypertension is defined as persistently elevated arterial Blood Pressure (BP) and it is identified as one of the most significant risk factors for Cardiovascular (CV) disease. Increasing awareness and diagnosis of hypertension, and improving control of BP with appropriate treatment are considered critical public health initiatives to reduce CV morbidity and mortality [3Dipiro JT, Talbert RL, Yee GC, Matzke GR, Wells BG, Posey LM. Pharmacotherapy, a pathophysiologic approach 9th ed. 9th ed.2014.]. A study done on global burden of blood-pressure-related disease revealed that Worldwide, 7·6 million premature deaths (about 13·5% of the global total) and 92 million Disability-Adjusted Life Years (DALYs) (6·0% of the global total) were attributed to high blood pressure [2Lawes CM, Vander Hoorn S, Rodgers A. Global burden of blood-pressure-related disease, 2001. Lancet 2008; 371(9623): 1513-8. [http://dx.doi.org/10.1016/S0140-6736(08)60655-8] [PMID: 18456100] ]. Even though there are medications that are used to treat hypertension, because of large proportion of patients not taking these medicines as prescribed the benefits of these drugs are not being realized and this indirectly raises the issue of therapeutic adherence among hypertensive persons [4Starr B, Sacks R. Improving outcomes for patients with chronic disease: The Medication Adherence Project 2010.]. The most frequently used definition of adherence is “the extent to which a person’s behavior – taking medication, following a diet, executing lifestyle changes – follows medical advice” [5Burkhart PV, Sabaté E. Adherence to long-term therapies: evidence for action. J Nurs Scholarsh 2003; 35(3): 207. [PMID: 14562485] ]. Adherence has also been defined as “the extent to which patient behavior corresponds with recommendations from a health care provider” [5Burkhart PV, Sabaté E. Adherence to long-term therapies: evidence for action. J Nurs Scholarsh 2003; 35(3): 207. [PMID: 14562485] ]. A review from the 2095 articles identified that therapeutic non-adherence occurs when an individual’s health-seeking behavior lacks similarity with the recommendations as prescribed [6Jin J, Sklar GE, Min Sen Oh V, Chuen Li S. Factors affecting therapeutic compliance: A review from the patient’s perspective. Ther Clin Risk Manag 2008; 4(1): 269-86. [PMID: 18728716] ]. Non adherence to treatment medication and lifestyle modification is a complicated issue affecting patients’ health, health expenditure, and resources’ utilization while adherence to Antihypertensive Treatment (AHT) has been associated with improved blood pressure (BP), decreased hospitalizations rates, and lower medical care costs [7Sarradon-Eck A, Egrot M, Blance MA, Faure M. Anthropological approach of adherence factors for antihypertensive drugs. Healthcare Policy 2010; 5(4): e157-75. [PMID: 21532764] -9Degli Esposti L, Saragoni S, Benemei S, et al. Adherence to antihypertensive medications and health outcomes among newly treated hypertensive patients. Clinicoecon Outcomes Res 2011; 3: 47-54. [http://dx.doi.org/10.2147/CEOR.S15619] [PMID: 21935332] ]. Survey conducted 2003-2004 showed only 37% of hypertensive patients have their blood pressure controlled [10Ong KL, Cheung BM, Man YB, Lau CP, Lam KS. Prevalence, awareness, treatment, and control of hypertension among United States adults 1999-2004. Hypertension 2007; 49(1): 69-75. [http://dx.doi.org/10.1161/01.HYP.0000252676.46043.18] [PMID: 17159087] ]. Uncontrolled high blood pressure indirectly raises the issue of therapeutic adherence among hypertensive persons [11Brown MT, Bussell JK. Medication adherence: WHO cares? Mayo Clin Proc 2011; 86(4): 304-14. [http://dx.doi.org/10.4065/mcp.2010.0575] [PMID: 21389250] ]. According to the WHO, poor adherence to treatment is the most important cause of uncontrolled blood pressure and only 20 to 80% of patients receiving treatment for hypertension in real life situations are considered to be “good compliers” [5Burkhart PV, Sabaté E. Adherence to long-term therapies: evidence for action. J Nurs Scholarsh 2003; 35(3): 207. [PMID: 14562485] ]. Different studies had identified factors determining the levels of antihypertensive drug adherence such as; the complexity of the treatment, the drugs’ side effects, the balance between established medical guidelines and their own convictions, communication between patient and doctor, patient’s satisfaction with the healthcare system, socio-economic factors, socio-demographic factors, the cost of treatment and lack of medical insurance [3Dipiro JT, Talbert RL, Yee GC, Matzke GR, Wells BG, Posey LM. Pharmacotherapy, a pathophysiologic approach 9th ed. 9th ed.2014., 6Jin J, Sklar GE, Min Sen Oh V, Chuen Li S. Factors affecting therapeutic compliance: A review from the patient’s perspective. Ther Clin Risk Manag 2008; 4(1): 269-86. [PMID: 18728716] , 7Sarradon-Eck A, Egrot M, Blance MA, Faure M. Anthropological approach of adherence factors for antihypertensive drugs. Healthcare Policy 2010; 5(4): e157-75. [PMID: 21532764] , 12Jambedu Ha. Adherence to anti-hypertensive medication regimens among patients attending the G.P.H.A. hospital in takoradi – Ghana 2006.-25Bader RJ, Koprulu F, Hassan NA, Ali AA, Elnour AA. Predictors of adherence to antihypertensive medication in northern United Arab Emirates. East Mediterr Health J 2015; 21(5): 309-18. [http://dx.doi.org/10.26719/2015.21.5.309] [PMID: 26343119] ]. This study aimed to examine adherence to antihypertensive medication and to assess factors associated with non-adherence to medications at Nedjo General Hospital. Identification of non-adherence related factors will help the healthcare professionals and patients to work on those factors to improve non-adherence. The findings of the study will also suggest strategies for improving non-adherence. As there was no study done in West Ethiopia, this study will help as a base to perform further studies. The study was conducted in Nedjo General Hospital (NGH), Nedjo town, Western Wollega zone, Oromia region, western Ethiopia which is found 496 km from Addis Ababa, a capital city of Ethiopia. The study was conducted from March 15 to May 5, 2015. The study was conducted using hospital based descriptive cross–sectional study design which involves quantitative methods. All adult hypertensive patients attending the facility on out-patient basis during the study period and attended the chronic care department for hypertension care at least for one year and volunteered to take part in the study were used for the study. A total of 172 hypertensive patients were included in the study. Patients who are critically ill, psychotic and/or unable to communicate with data collector due to other underlying medical disorder were excluded. Data were collected using a questionnaire consisting of the 8- item morisky medication adherence scale [26Morisky DE, Ang A, Krousel-Wood M, Ward HJ. Predictive validity of a medication adherence measure in an outpatient setting. J Clin Hypertens (Greenwich) 2008; 10(5): 348-54. [http://dx.doi.org/10.1111/j.1751-7176.2008.07572.x] [PMID: 18453793] ] which was adapted to our set up and self-reported medication adherence questions relating to medication use and major reasons for non-adherence which were designed-based on an extensive literature review of similar studies [12Jambedu Ha. Adherence to anti-hypertensive medication regimens among patients attending the G.P.H.A. hospital in takoradi – Ghana 2006., 21Oliveira-Filho AD, Barreto-Filho JA, Neves SJ, Lyra Junior DP. Association between the 8-item morisky medication adherence scale (MMAS-8) and blood pressure control. Arq Bras Cardiol 2012; 99(1): 649-58. [http://dx.doi.org/10.1590/S0066-782X2012005000053] [PMID: 22688844] , 24Hashmi SK, Afridi MB, Abbas K, et al. Factors associated with adherence to anti-hypertensive treatment in Pakistan. PLoS One 2007; 2(3): e280. [http://dx.doi.org/10.1371/journal.pone.0000280] [PMID: 17356691] , 27Odusola AO, Hendriks M, Schultsz C, et al. Perceptions of inhibitors and facilitators for adhering to hypertension treatment among insured patients in rural Nigeria: a qualitative study. BMC Health Serv Res 2014; 14: 624. [http://dx.doi.org/10.1186/s12913-014-0624-z] [PMID: 25491509] ]. The questionnaire was presented to each patient with proper explanation and face to face interviews were conducted when patients came for follow up checkup. Patient medication charts were also reviewed carefully for assessing the characteristics of hypertension and antihypertensive treatment. Data collection was conducted with appropriate training of the data collectors and continuous advices to keep the quality of the data. Close supervision was made by the investigators and the collected data were checked for completeness every day. For completeness and consistency, standardized questionnaire of English version was translated to local language Afaan Oromoo. Then, it was again translated to English and checked. Medication adherence: Adherence to antihypertensive medications was measured using the 8-item Morisky medication adherence scale. Individual item scores were summed and those with a score of 8 were considered adherent to medication. Medium adherence corresponded to a score of 6–8, while a score of <6 was considered low adherence [26Morisky DE, Ang A, Krousel-Wood M, Ward HJ. Predictive validity of a medication adherence measure in an outpatient setting. J Clin Hypertens (Greenwich) 2008; 10(5): 348-54. [http://dx.doi.org/10.1111/j.1751-7176.2008.07572.x] [PMID: 18453793] ]. Medication non-adherence referred to a score of <8 (i.e., medium or low adherence). Extra salt intake was defined as “Patients who report the addition of salt in food on table”. After data collection, data were entered into the Statistical Package for the Social Sciences (SPSS) version 20 for analysis. Odds ratio with 95% confidence interval, along with binary and multiple logistic regression was used to assess the significance and strength of association. All factors with a p-value <0.25 in the bivariable logistic regression analysis were further entered into the multivariable model to control confounding effects. A significance level of alpha = 5% was used to identify statistically significant association. Socio demographic characteristic of the study participants at Nedjo General Hospital, West Ethiopia, from March 15 to May 5, 2015 (n = 172). A total of 172 hypertensive patients out of the 184 cases were included in the study. Twelve of the respondents were excluded by the exclusion criteria. Of this 5 were not volunteer to participate while 7 patients, even though they are volunteer they did not fulfill the inclusion criteria because they were newly diagnosed for hypertension and medication initiation was less than one year. So the response rate was 93.5%. Majority of the respondents were females (55.8%). The mean age of the respondents was 51.5 + 12.1 years. Out of the study participants 49.4% were in the age range of 35-54 years. More than half of the study participants 119 (69.2%) were married and 84 (48.8%) were farmers (Table 1). Most of the respondents, 109 (63.4%) were taking a single antihypertensive medication and 48 (27.9%) respondents were taking two antihypertensive medication. Among 172 study participants, 72 (41.9%) respondents were treated for less than two years and 51 (29.7%) were treated for > 5 years. Regarding knowledge of the study participants about hypertension and its treatment, more than half of the study participants 112 (65.1%) had inadequate knowledge about hypertension and its treatment (Table 2). Drug, disease and food related factors of the study participants at Nedjo General Hospital, West Ethiopia, from March 15 to May 5, 2015 (n = 172). Most of the study participants 118 (68.6%) were non-adherent to antihypertensive medications, whereas 54 (31.4%) were adherent (Table 2). For non-adherent respondents 118 (68.6%), the major reasons for non-adherence were forgetfulness 81 (47.1%), followed by inability to buy medications 29 (16.9%) (Table 3). Reason for non-adherence of the study participants at Nedjo General Hospital, West Ethiopia, from March 15 to May 5, 2015 (n = 172). In our study regarding antihypertensive medications Hydrochlorothiazide, 45 (26.2%) and Enalapril, 44 (25.6%) were the commonly prescribed antihypertensive medications followed by Nifedipine 20 (11.6%) and a combination of Enalapril plus Hydrochlorothiazide 20 (11.6%) Fig. (1 ). Antihypertensive regimen among study participants at Nedjo General Hospital, West Ethiopia, from March 15 to May 5, 2015 (n = 172). The bivariable analysis showed that non-adherence was associated with marital status, occupation, place of residence, level of education, income status, number of antihypertensive medication, physical activity, extra salt intake and knowledge of hypertension. However, other factors did not show statistically significant association with non-adherence (Table 4). Majority of patients with age > 55 years, patients who live in rural, patients who are illiterate and their level of education was elementary and patients with low level of Knowledge about hypertension and treatment were non-adherent to their antihypertensive medication (Table 4). Bivariable analysis of factors associated with Non-adherence among hypertensive patients in Nedjo General Hospital, West Ethiopia, from March 15 to May 5, 2015. Multivariable logistic regression have shown that variables such as age, level of education, monthly income status, duration of treatment, physical activity status and knowledge about hypertension and treatment were associated with non-adherence to antihypertensive medications. Factors like marital status, occupation, place of residence, number of antihypertensive medication and extra salt intake have shown significant association in bivariable analysis but the effect was absent after controlling for confounding factors (Table 5). Multivariable analysis of factors associated with Non-adherence among hypertensive patients in Nedjo General Hospital, West Ethiopia, March 15 to May 5, 2015. Despite the availability of effective treatments, studies have shown that in many countries less than 25% of patients treated for hypertension achieve optimum blood pressure. Poor adherence has been identified as the main cause of failure to control hypertension [5Burkhart PV, Sabaté E. Adherence to long-term therapies: evidence for action. J Nurs Scholarsh 2003; 35(3): 207. [PMID: 14562485] ]. In this study, only 31.4% of the study participants were adherent to their medication. This is comparable to studies reported from hospitals in Ghana and Nigeria 33.3%, Kenya 31.8%, Palestine 36.2%, Nepal 35.4% [17Boima V, Ademola AD, Odusola AO, et al. Factors associated with medication nonadherence among hypertensives in ghana and nigeria 2015., 28Achieng’ L, Joshi MD, Ogola EN, Karari E. Adequacy of blood pressure control and level of adherence with antihypertensive therapy. East Afr Med J 2009; 86(11): 499-506.-30Khan GM, Thapa RK, Khakurel A, Shrestha G, Katila N, Bhurtel S. Medication adherence and blood pressure control among hypertensive patients of pokhara valley. JHAS 2013; 3(1): 64-7.]. When we compare the current finding to other studies done in Ethiopia, adherence to antihypertensive treatment was lower than studies done in University of Gondar Referral Hospital 64.6%, Black Lion Hospital 69.2%, Northern Ethiopia 52.9%, Adama Referral Hospital 59.5% [13Ambaw AD, Alemie GA. W/Yohannes SM, Mengesha ZB. Adherence to antihypertensive treatment and associated factors among patients on follow up at University of Gondar Hospital, Northwest Ethiopia. BMC Public Health 2012; 12: 282. [http://dx.doi.org/10.1186/1471-2458-12-282] [PMID: 22490130] -16Hareri HA, Gedefaw M, Simeng B. Assessment of prevalence and associated factors of adherence to antihypertensive agents among adults on follow up in adama referal hospital, east shoa, ethiopia-cross sectional study. Int J Curr Microbiol Appl Sci 2014; 3(1): 760-70.]. Similarly the adherence to antihypertensive treatment found in current study was lower than studies done in Ghana 68.7%, Nigeria 44.7%, Zambia 83%, Malaysia 48.7%, Brazil 52.9%, Italy 48.6%, USA 57.6%, Pakistan 77%, United Arab Emirates 54.4% [12Jambedu Ha. Adherence to anti-hypertensive medication regimens among patients attending the G.P.H.A. hospital in takoradi – Ghana 2006., 18Ajayi EA, Adeoti AO, Ajayi IA, Ajayi AO, Adeyeye VO. Adherence to antihypertensive medications and some of its clinical implications in patients seen at a tertiary hospital in nigeria. IOSR J Dental Med Sci 2013; 8(4): 36-40. [http://dx.doi.org/10.9790/0853-0843640] -25Bader RJ, Koprulu F, Hassan NA, Ali AA, Elnour AA. Predictors of adherence to antihypertensive medication in northern United Arab Emirates. East Mediterr Health J 2015; 21(5): 309-18. [http://dx.doi.org/10.26719/2015.21.5.309] [PMID: 26343119] ]. The reason for the difference might be due to better access and skilled health care professionals for the patients in these regions and countries. It could also be due to participants’ better knowledge toward hypertension and its management than the current study area. The results of this study suggest that greater effort is needed to improve patient adherence to antihypertensive medications at Nedjo General Hospital. To improve adherence the following intervention should be done: education on the use of medicines, management of disease and treatment in conjunction with patients, adherence education, multidisciplinary care, training in monitoring adherence, more intensive intervention by increasing the number and duration of contacts [5Burkhart PV, Sabaté E. Adherence to long-term therapies: evidence for action. J Nurs Scholarsh 2003; 35(3): 207. [PMID: 14562485] ]. In addition involving the patient's family members and friends in providing education on the importance of adherence to antihypertensive medications and telling them the consequences if the patient is not adherent to his medication should also be targeted/ adopted. The results obtained from multivariable logistic regression analysis of the present study revealed that younger age, being illiterate, income status of <500 Ethiopian birr, duration of treatments of >5 years, physical inactivity and knowledge deficit about hypertension were associated with non-adherence. In this study, age was significantly associated (p=0.035) with non-adherence observed in younger age. The present finding is consistent with that reported by other studies from Adama Referral Hospital [16Hareri HA, Gedefaw M, Simeng B. Assessment of prevalence and associated factors of adherence to antihypertensive agents among adults on follow up in adama referal hospital, east shoa, ethiopia-cross sectional study. Int J Curr Microbiol Appl Sci 2014; 3(1): 760-70. ], in hospitals of Ghana and Nigeria [17Boima V, Ademola AD, Odusola AO, et al. Factors associated with medication nonadherence among hypertensives in ghana and nigeria 2015. ], Nigeria [18Ajayi EA, Adeoti AO, Ajayi IA, Ajayi AO, Adeyeye VO. Adherence to antihypertensive medications and some of its clinical implications in patients seen at a tertiary hospital in nigeria. IOSR J Dental Med Sci 2013; 8(4): 36-40. [http://dx.doi.org/10.9790/0853-0843640] ] and Pakistan [24Hashmi SK, Afridi MB, Abbas K, et al. Factors associated with adherence to anti-hypertensive treatment in Pakistan. PLoS One 2007; 2(3): e280. 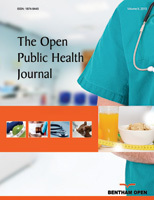 [http://dx.doi.org/10.1371/journal.pone.0000280] [PMID: 17356691] ]. A probable reason for better adherence in elderly might be because of a better care given by the family members for patients in this age group. The other reason could be patients with younger age could be reluctant for their medication. Older people might have more concern about their health than younger patients, so that older patients’ non-compliance is non-intentional in most cases. As a result, if they can get the necessary help from healthcare providers or family members, they may be more likely to be compliant with therapies [6Jin J, Sklar GE, Min Sen Oh V, Chuen Li S. Factors affecting therapeutic compliance: A review from the patient’s perspective. Ther Clin Risk Manag 2008; 4(1): 269-86. [PMID: 18728716] ]. Present study revealed that participants who were illiterate (p=0.049) and participants whom educational status was elementary (p=0.002) were significantly associated with non-adherence. Similar results were reported from studies in hospitals of Ghana and Nigeria [17Boima V, Ademola AD, Odusola AO, et al. Factors associated with medication nonadherence among hypertensives in ghana and nigeria 2015. ], Zambia [19Mweene MD, Banda J, Andrews B. M-Mweene M, SLakhi. Factors associated with poor medication adherence in hypertensive patients in lusaka, zambia. Med J Zambia 2010; 37(3): 252-61. ], Pakistan [24Hashmi SK, Afridi MB, Abbas K, et al. Factors associated with adherence to anti-hypertensive treatment in Pakistan. PLoS One 2007; 2(3): e280. [http://dx.doi.org/10.1371/journal.pone.0000280] [PMID: 17356691] ] and Nepal [30Khan GM, Thapa RK, Khakurel A, Shrestha G, Katila N, Bhurtel S. Medication adherence and blood pressure control among hypertensive patients of pokhara valley. JHAS 2013; 3(1): 64-7.]. This could be due to lack of awareness about hypertension, its management and medications for this condition in this study area. It may be expected that patients with higher educational level should have better knowledge about the disease and therapy and therefore be more compliant [6Jin J, Sklar GE, Min Sen Oh V, Chuen Li S. Factors affecting therapeutic compliance: A review from the patient’s perspective. Ther Clin Risk Manag 2008; 4(1): 269-86. [PMID: 18728716] ]. To improve adherence in illiterate patients and patients with low level of education, interventions to optimize adherence must go beyond the provision of advice and prescriptions; supplementing oral teaching with written materials are required to improve adherence [5Burkhart PV, Sabaté E. Adherence to long-term therapies: evidence for action. J Nurs Scholarsh 2003; 35(3): 207. [PMID: 14562485] ]. Using simple, everyday language, when explaining about the disease and giving instructions will also improve their adherence. Different studies have identified inability to afford the cost of medications as an important barrier to medication adherence [14Hareri HA, Abebe M, Asefaw T. Assessments of adherence to hypertension managements and its influencing factors among hypertensive patients attending black lion hospital chronic follow up unit, Addis Ababa, Ethiopia-a cross-sectional study. IJPSR 2013; 4(3): 1086-95., 17Boima V, Ademola AD, Odusola AO, et al. 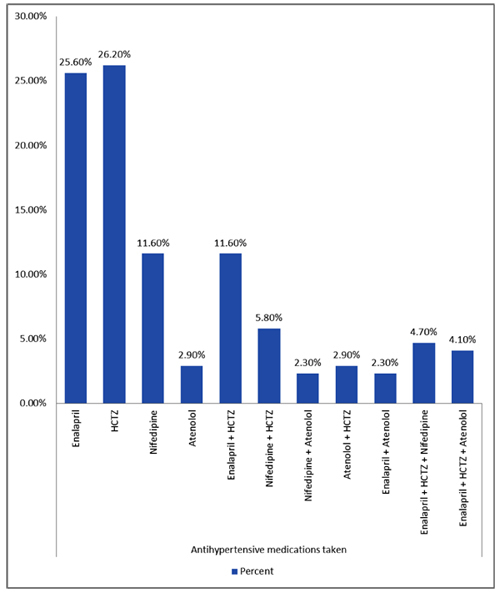 Factors associated with medication nonadherence among hypertensives in ghana and nigeria 2015., 24Hashmi SK, Afridi MB, Abbas K, et al. Factors associated with adherence to anti-hypertensive treatment in Pakistan. PLoS One 2007; 2(3): e280. [http://dx.doi.org/10.1371/journal.pone.0000280] [PMID: 17356691] , 29Zyoud SH, Al-Jabi SW, Sweileh WM, Morisky DE. Relationship of treatment satisfaction to medication adherence: findings from a cross-sectional survey among hypertensive patients in Palestine. Health Qual Life Outcomes 2013; 11: 191. [http://dx.doi.org/10.1186/1477-7525-11-191] [PMID: 24195638] ]; however these studies did not show association of medication adherence with level of income. Unlike thus studies, this study showed an association between level of income and non-adherence (p=0.011) with non-adherence 18.51 times more likely to occur in patients with low income than higher income. The reason could be because of patients with low income cannot able to afford the cost of medication. In this study, duration of treatment was significantly associated (p=0.041) with non-adherence and patients on hypertension treatment for more than or equal to five years were 5.41 times more likely to be non-adherent than those with duration of treatments of less than two years. Similar finding was reported from study done in Black Lion Hospital [14Hareri HA, Abebe M, Asefaw T. Assessments of adherence to hypertension managements and its influencing factors among hypertensive patients attending black lion hospital chronic follow up unit, Addis Ababa, Ethiopia-a cross-sectional study. IJPSR 2013; 4(3): 1086-95.]. This could be because long use of drugs would burden the patient and lead to forget their medication and discontinue medication too soon. Beside once the patient blood pressure had got stabilized they might felt to be in better condition. A study done in Nigeria [27Odusola AO, Hendriks M, Schultsz C, et al. Perceptions of inhibitors and facilitators for adhering to hypertension treatment among insured patients in rural Nigeria: a qualitative study. BMC Health Serv Res 2014; 14: 624. [http://dx.doi.org/10.1186/s12913-014-0624-z] [PMID: 25491509] ] revealed that exercise is a facilitator for adherence to antihypertensive medication. The result of present study showed that, physical inactivity was significantly associated (p=0.001) with non-adherence. Physicians should help patients find an activity that they enjoy, because enjoyment will increase their adherence [31Wexler R, Aukerman G. Nonpharmacologic strategies for managing hypertension. Am Fam Physician 2006; 73(11): 1953-6. [PMID: 16770925] ]. In this study, lack of knowledge about hypertension and its treatment was significantly associated with non-adherence. The present finding is consistent with that reported by other studies from University of Gondar Referral Hospital [13Ambaw AD, Alemie GA. W/Yohannes SM, Mengesha ZB. Adherence to antihypertensive treatment and associated factors among patients on follow up at University of Gondar Hospital, Northwest Ethiopia. BMC Public Health 2012; 12: 282. [http://dx.doi.org/10.1186/1471-2458-12-282] [PMID: 22490130] ], Adama Referral Hospital [16Hareri HA, Gedefaw M, Simeng B. Assessment of prevalence and associated factors of adherence to antihypertensive agents among adults on follow up in adama referal hospital, east shoa, ethiopia-cross sectional study. Int J Curr Microbiol Appl Sci 2014; 3(1): 760-70. ], in hospitals of Ghana and Nigeria [17Boima V, Ademola AD, Odusola AO, et al. Factors associated with medication nonadherence among hypertensives in ghana and nigeria 2015. ], Pakistan [24Hashmi SK, Afridi MB, Abbas K, et al. Factors associated with adherence to anti-hypertensive treatment in Pakistan. PLoS One 2007; 2(3): e280. [http://dx.doi.org/10.1371/journal.pone.0000280] [PMID: 17356691] ], United Arab Emirates [25Bader RJ, Koprulu F, Hassan NA, Ali AA, Elnour AA. Predictors of adherence to antihypertensive medication in northern United Arab Emirates. East Mediterr Health J 2015; 21(5): 309-18. [http://dx.doi.org/10.26719/2015.21.5.309] [PMID: 26343119] ] and Congo [32Lulebo AM, Mutombo PB, Mapatano MA, et al. Predictors of non-adherence to antihypertensive medication in Kinshasa, Democratic Republic of Congo: a cross-sectional study. BMC Res Notes 2015; 8: 526. [http://dx.doi.org/10.1186/s13104-015-1519-8] [PMID: 26427798] ]. Right knowledge about HTN and its treatment creates a clear understanding and avoids confusion about the treatment and the disease condition [5Burkhart PV, Sabaté E. Adherence to long-term therapies: evidence for action. J Nurs Scholarsh 2003; 35(3): 207. [PMID: 14562485] ]. The present study revealed that the major reasons for non-adherence were forgetfulness followed by inability to buy medications. To improve non adherence related to forgetfulness we recommend the patients to use medication boxes with dates/times written on them (“Pill organizers”) or setting an alarm clock. For patients with lack of finance, we recommend the government to find a means in which patients with lack of finance that cannot afford the cost of medication can get the medications; for example providing medications for free for patients that cannot afford the cost of medication, creating drug discount cards that can be helpful to patients who can afford to pay part of their prescription costs. Strengths of our study were that adherence to antihypertensive medications was measured by using the 8-item Morisky medication adherence scale and data were collected from patients’ card and by face to face interview with patients; this helped us to have more complete information. Limitations of our study were that, this study was conducted only in government District Hospitals in Nedjo Town and did not include patients who attended private Hospitals. Therefore results cannot be generalized to all hypertension patients in Nedjo woreda. However, the results have important insights for same hospitals within the same characteristics. Self-reporting was used for measuring adherence. This method has the disadvantages of recall bias and eliciting only socially acceptable responses and hence, may, lead to overestimation of some of the results, because they are self- reports by the patients which can be misleading. In general, a finding of this study revealed that an adherence status of study participants was low. Thus greater effort is needed to improve patient adherence to antihypertensive medications. The major reasons for non-adherence among the study participants were forgetfulness, followed by inability to buy medications. Factors such as age, educational level, income status, duration of treatments, physical activity and knowledge deficit about hypertension and its treatment were significantly associated with non-adherence. We recommend that practitioners should always look for poor adherence and enhance adherence by emphasizing the value of a patient’s regimen, making the regimen simple, and customizing the regimen to the patient’s lifestyle. Health care professionals should assist hypertensive patients develop systems that will remind them to take their medications. There should be total collaboration between all the health professionals in the institution to promote patient education and medication counseling. Ethical clearance was obtained from the Ethical Review Committee of Wollega University, College of Medical and Health Sciences. This committee wrote a formal letter of permission to Nedjo General Hospital to seek its cooperation and access to the data. Permission was obtained from the medical director’s office of the hospital. No Animals were used in this research. All human research procedures followed were approved by the Ethical Review Committee of Wollega University. After obtaining the required permission from the hospital, patient’s written informed consent was obtained after explaining about the purpose and procedures of the study. Patients were expected to be fully voluntary to participate in the study. In addition all the responses were kept confidential. We are grateful to the department of pharmacy, Wollega University for their unreserved cooperation in making this study to be a fruitful work. We are also thankful for the outpatient department nurses of Nedjo General Hospital for their cooperation in collecting the data and the patients who willingly participate in this study. Dipiro JT, Talbert RL, Yee GC, Matzke GR, Wells BG, Posey LM. Pharmacotherapy, a pathophysiologic approach 9th ed. 9th ed.2014. Starr B, Sacks R. Improving outcomes for patients with chronic disease: The Medication Adherence Project 2010. Jambedu Ha. Adherence to anti-hypertensive medication regimens among patients attending the G.P.H.A. hospital in takoradi – Ghana 2006. Hareri HA, Abebe M, Asefaw T. Assessments of adherence to hypertension managements and its influencing factors among hypertensive patients attending black lion hospital chronic follow up unit, Addis Ababa, Ethiopia-a cross-sectional study. IJPSR 2013; 4(3): 1086-95. Hareri HA, Gedefaw M, Simeng B. Assessment of prevalence and associated factors of adherence to antihypertensive agents among adults on follow up in adama referal hospital, east shoa, ethiopia-cross sectional study. Int J Curr Microbiol Appl Sci 2014; 3(1): 760-70. Boima V, Ademola AD, Odusola AO, et al. Factors associated with medication nonadherence among hypertensives in ghana and nigeria 2015. Mweene MD, Banda J, Andrews B. M-Mweene M, SLakhi. Factors associated with poor medication adherence in hypertensive patients in lusaka, zambia. Med J Zambia 2010; 37(3): 252-61. Suleiman A, Sulaiman S, Albarq A. Hospital admission and poor adherence to antihypertensive therapy: Is there any relationship? Int J Pharm Pharm Sci 2009; 2(1): 38-46. Achieng’ L, Joshi MD, Ogola EN, Karari E. Adequacy of blood pressure control and level of adherence with antihypertensive therapy. East Afr Med J 2009; 86(11): 499-506. Khan GM, Thapa RK, Khakurel A, Shrestha G, Katila N, Bhurtel S. Medication adherence and blood pressure control among hypertensive patients of pokhara valley. JHAS 2013; 3(1): 64-7.